After five years of existence Kallon FC - the club owned by striker Mohamed Kallon - can finally boast of silverware in the trophy cabinet. Crowned Sierra Leone champions with two matches to spare, the team is excited at the prospect of featuring in next year's African Champions League. Formerly known as Sierra Fisheries, the club was bought and rebranded by the Monaco striker for $25,000 in 2001. "I'm delighted that we won the league, it shows that I'm not spending cash and time for nothing," Kallon, the Sierra Leone captain, told BBC Sport after a 1-0 win over Wellington People gave them the title. "Now that we are in the Champions League I'll make sure that we'll prepare well." Abu Sankoh, the head coach of Kallon FC, who is winning his first league championship, said the team is determined not to rest on their oars. "We got all the financial support and motivation we needed from Kallon and backed by determination and commitment from the officials and players, we were able to make it," Sankoh told BBC Sport. Kallon's next plan is to provide better facilities for his crop of young players. Acquiring six acres of land at Adonkia, on the outskirts of the capital Freetown, the Former Inter Milan striker is building a training ground and club house for his team, with plans for a mini-stadium in the future. 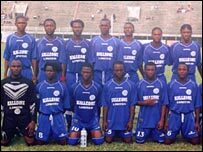 The Sierra Leone champions will be the first club in the country to get a club house and the second, after Old Edwardians - a team Kallon used to play for - to own their own training ground.